Even as the future of the program remains uncertain, the United States Mint launched the 19th issue of the Presidential Dollar series featuring Rutherford B. Hayes. An official ceremony was held on August 18, 2011 at the Rutherford B. Hayes Presidential Center in Fremont, Ohio. 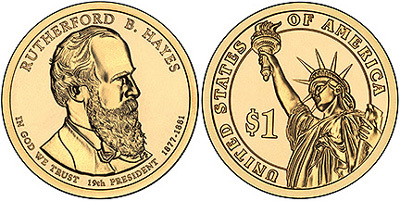 The obverse of the Rutherford B. Hayes Presidential Dollar features a portrait of the former president, along with inscriptions indicating his name, the order of the Presidency, the years of the term, and the motto “In God We Trust”. The reverse of the coin features a rendition of the Statue of Liberty that has been used in common for each issue of the broader series. The reverse inscriptions include “United States of America” and the denomination expressed as “$1”. The date, mint mark, and “E Pluribus Unum” appear on the edge of each coin. The official launch ceremony was attended by Marc Landry, Acting Associate Director of Manufacturing at the United States Mint, Thomas J. Clbertson, executive director of the Rutherford B. Hayes Presidential Center, and members of the public. Following the ceremony, children in attendance aged 18 and younger received a free $1 coin to commemorate the event. Other attendees were allowed to exchange currency for rolls of the new $1 coins.